Disinfecting has always been an important part of the cleaning process, especially when it comes to superbugs. 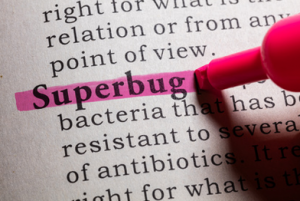 If you’re unfamiliar with the term, a superbug is an antibiotic-resistant bacterial infection. Some examples are Staphylococcus aureus (Methicillin Resistant) (MRSA) and E.Coli. (Antibiotic Resistant). There is only one way to prevent and control these nasty diseases and that is through better cleaning and disinfecting. The important thing to remember when trying to disinfect is that the longer a product lies on a surface, the more effective it will be. It is necessary that you get as close to the recommended dwell times as possible before wiping away the product. Products with shorter dwell times do exist and are effective, but they’re best for certain customers. Hospitals, for example, prefer a short dwell time due to the fast turnover of their patients. Others prefer a longer dwell time because it is considered the tried & true method and it is not going anywhere. In fact, both public and private offices will often select a product with a longer dwell time because there really is no reason to change their methods. Luckily, Misco Products offers products with both types of dwell times. For quick disinfecting, a product such as Fresh Breeze TB will get the job done. If you’re interested in taking your time, a product like A2Z will come in handy. There are many more products that can help keep superbugs at bay, so for more information check out our disinfectants page on our website.